Since my significant other is on vacation and I don’t really entertain myself well I decided I would turn my attention to the pet battle side of the World of Warcraft to see if it could keep my attention and if I would enjoy it as much as I enjoy playing Pokémon. 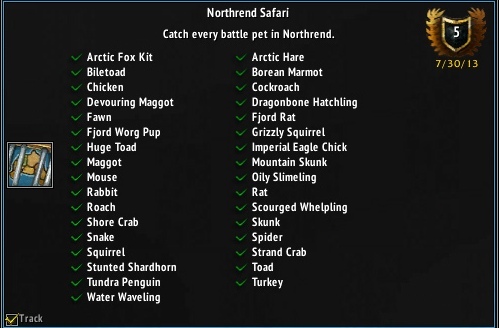 Most of my pets so far have come from achievements, vendors, drops and the pet store and I hadn’t spent much time catching pets because I felt like it was boring, however since I’m bored on WoW now anyway that I don’t raid I figured I might aswell set out on a quest to catch them all! 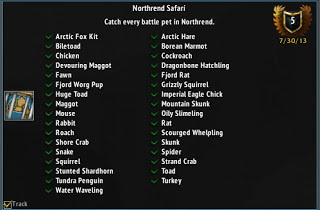 And so I started yesterday with the Northrend Safari, one that doesn’t really require too many pets to catch and if I was lucky I could get my hands on an Unborn Val’kyr, one of the more rare spawns in the game. And now here we are, about 24 hours later and I have completed my Northrend Safari and… got my hands on an Unborn Val’kyr!! How lucky am I huh? I was also lucky enough to have it snow in Storm Peaks so the Arctic Fox Kit would spawn and so this was probably one of the fastest Safari Achievements that could be done. And doesn’t my Paladin look cool with the tiny Val’kyr at her side?